We took a little side-trip to Hoorn (The Netherlands) to check-out the Stoomtram Hoorn - Medemblik. 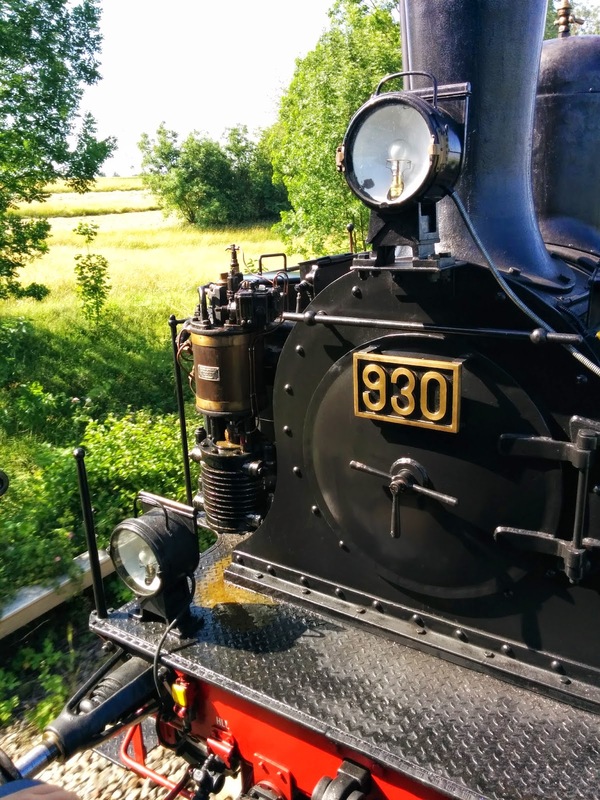 This museum steam train runs a daily (!) 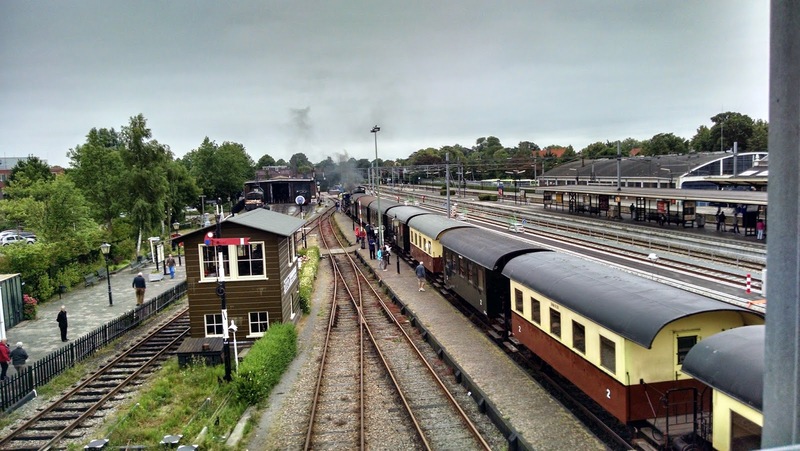 round-trip, and even more trains during summer weekends. 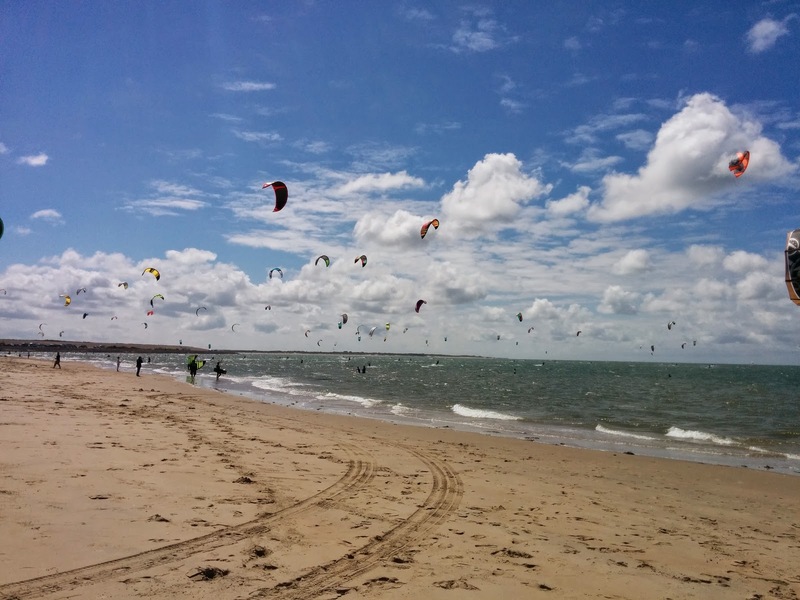 We decided to buy a one-way ticket for me and the kids, and Patricia would pick us up in Medemblik. This worked out nicely since it left enough time in the day to visit the very worthwhile Zuiderzee Museum in the afternoon. 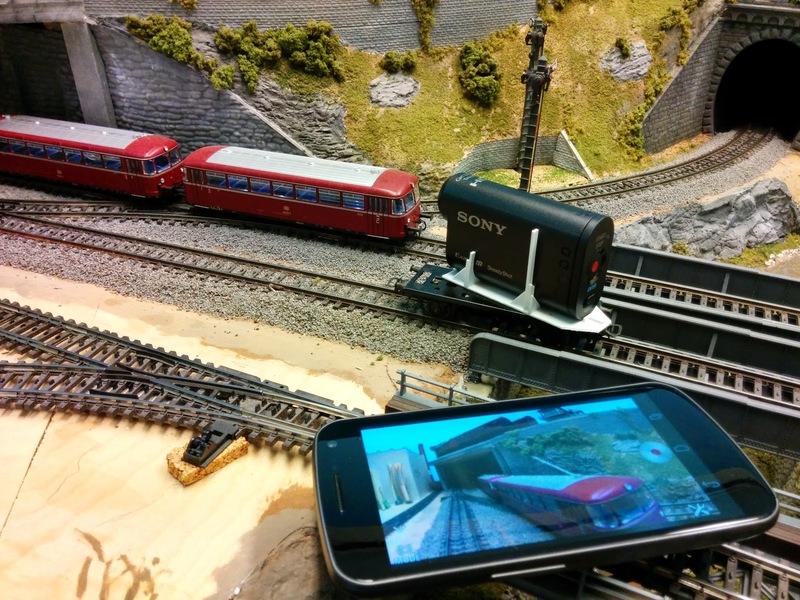 The train travels at a very leisurely pace through mostly rural areas. There are a couple intermediate stops, too. The kids counted at least a dozen large rabbits running away from the train. Locomotive Number 5 was built 1929 in Belgium for use as an industrial switcher. The engine had a major overhaul in 2012 and is currently in regular museum service. I find it fascinating that the smallest locomotives often have the most complicated driver arrangement. As mentioned in the first part, T3 Nr. 930 didn't accompany us all the way to Backnang. 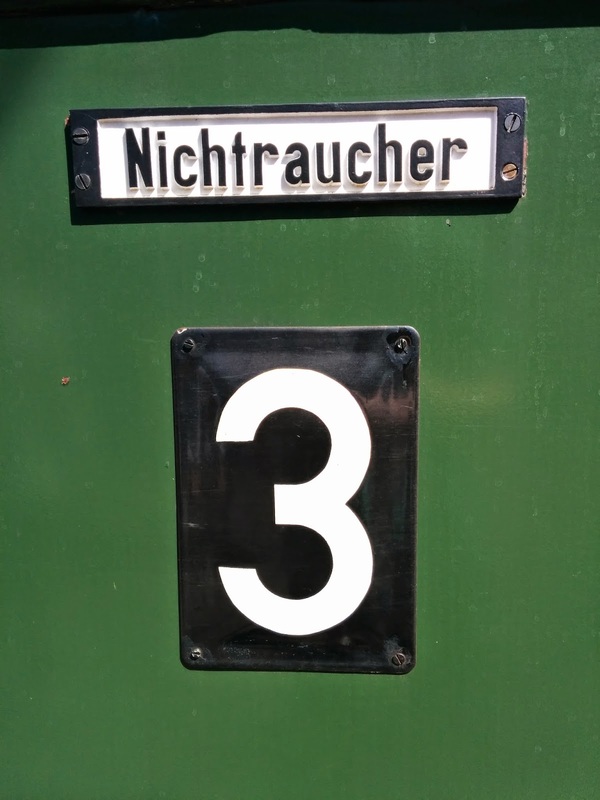 I'm not sure if that was because of schedule timing with the S-Bahn, or fire danger from the steam engine. 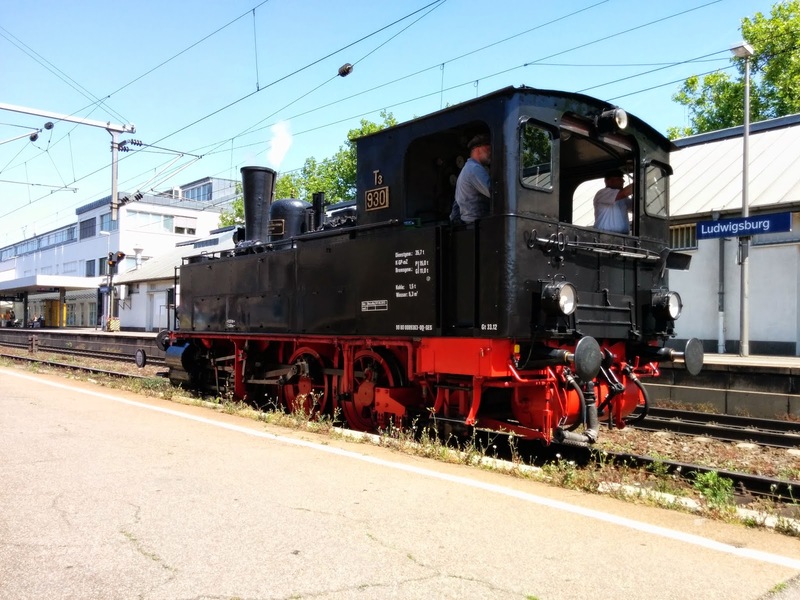 One little boy on the platform was very, very sad when we left the steam engine behind in Marbach and could only be calmed down when we assured him that we'd pick it back up on the return trip. Either way, we got to enjoy E94 088, a heavy six-axle freight locomotive built in 1943. While the original reason for their existence in large numbers is less enjoyable, it's an experience when an E94 rolls by. Even at switching speeds the ground is shaking under your feet, and while these locomotives are well known among the personnel for their ability to pull even the heaviest freight trains, the track maintenance department wasn't nearly as fond of them. I even got the opportunity to pose with my favorite electric locomotive in Backnang before we headed back to Ludwigsburg. 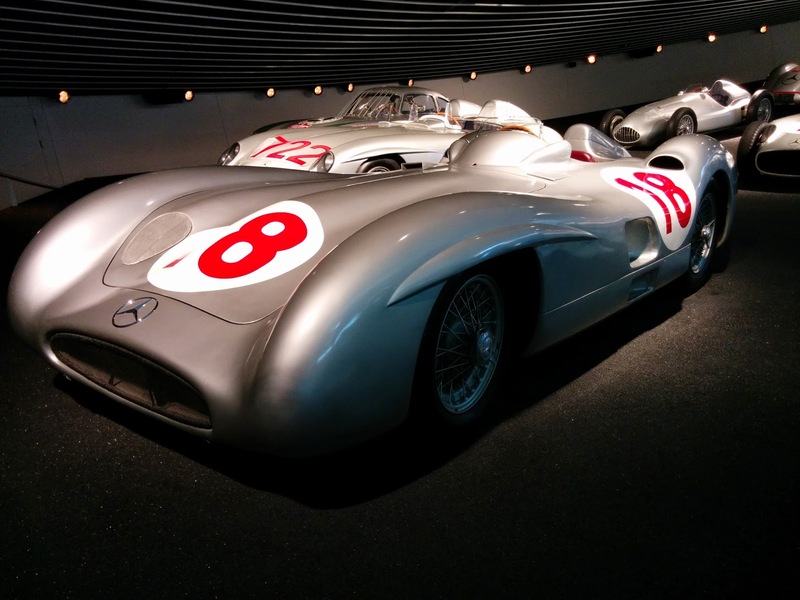 As you can see, I'm not the only one who was enthralled by that much raw power built over 70 years ago. You may have noticed that I like trains and railroads. 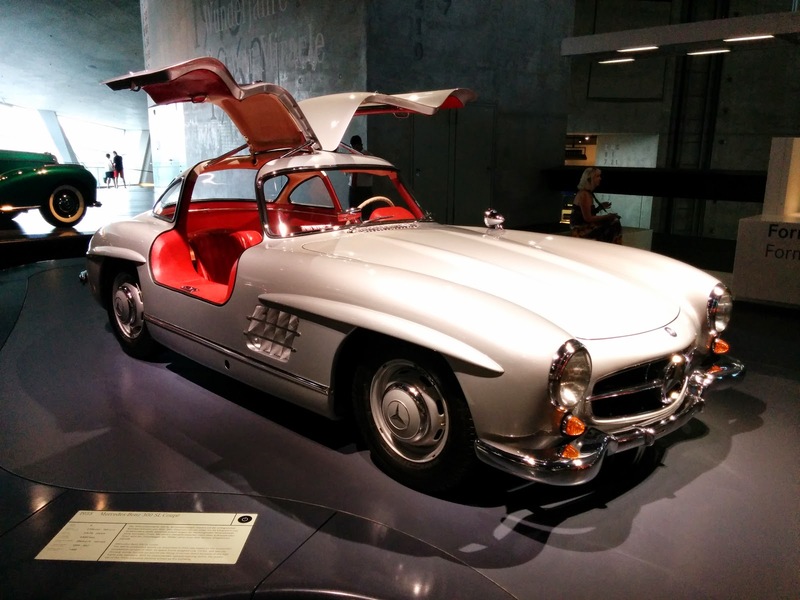 Nevertheless, as a transportation engineer I appreciate cars, too, and thus we made our way today to the Mercedes Benz Museum in Stuttgart-Untertuerkheim. Let's start off with a model that most visitors to the museum won't even notice. 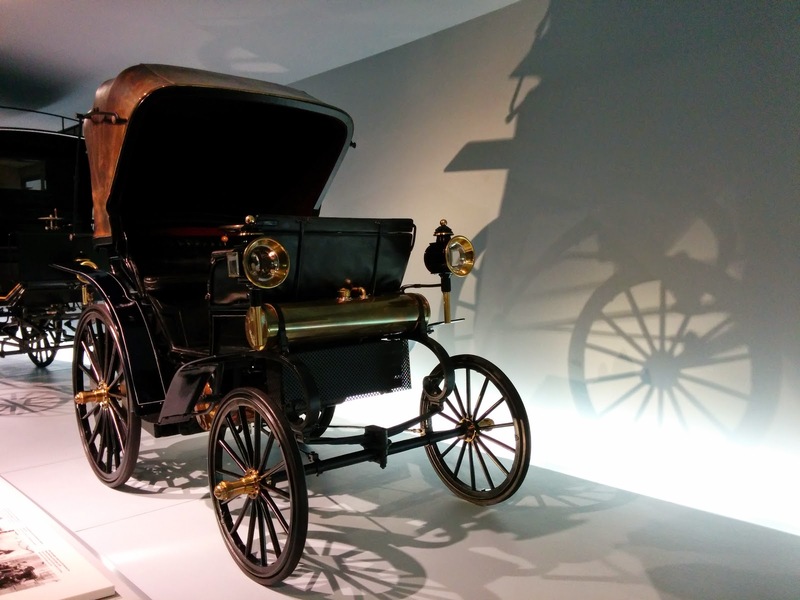 There's a series of display cases that show state of the art transportation before the advent of the automobile. 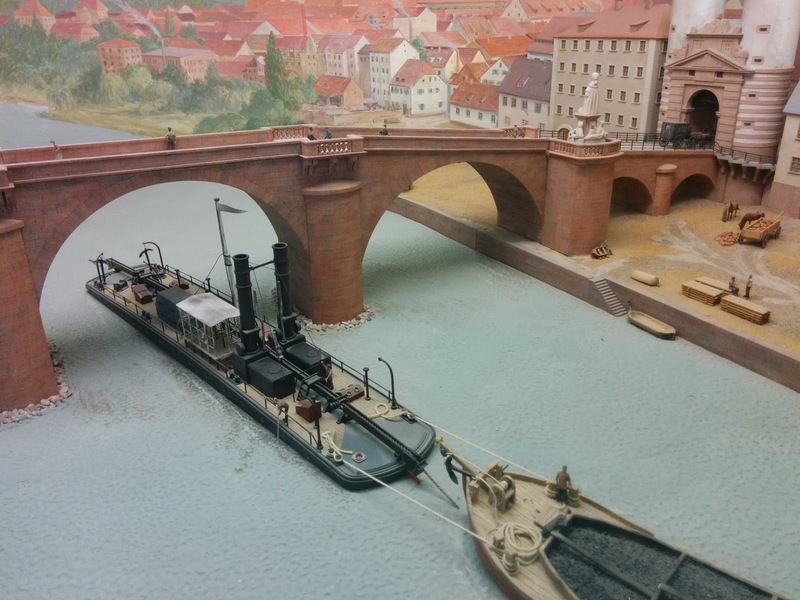 Model of river transportation in the 19th century. The Neckar at Esslingen stone bridge. Chain ships transport barges up the river by pulling on a chain that's installed on the river bottom over a distance of 130km. 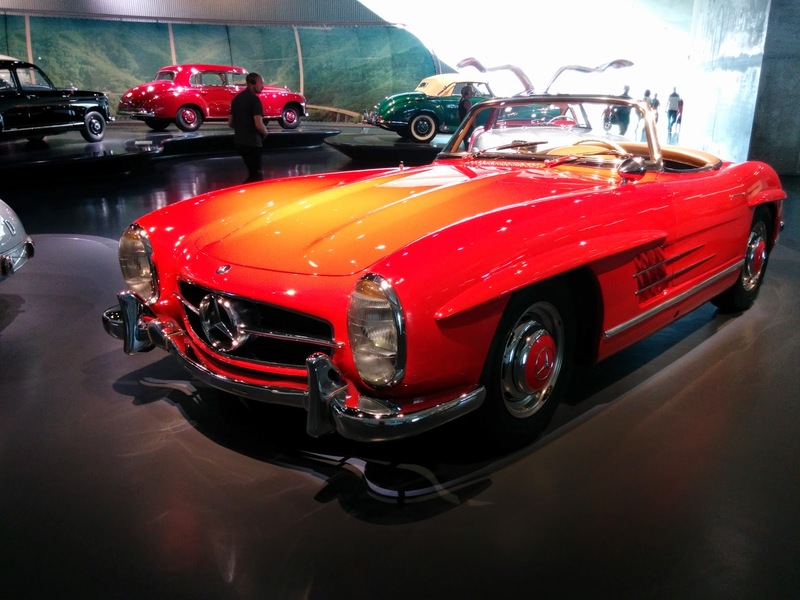 The museum spans the history of Mercedes Benz cars, trucks, and busses from early times to recently. 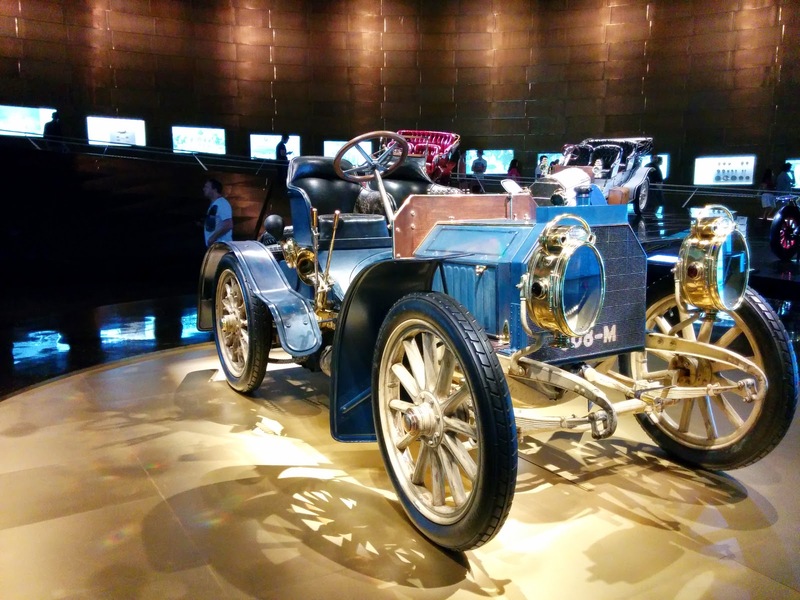 A period car. I especially like the shadow effect along the back wall. I really enjoyed the displays in the sports cars section. Oh yeah, I'd like this one please. 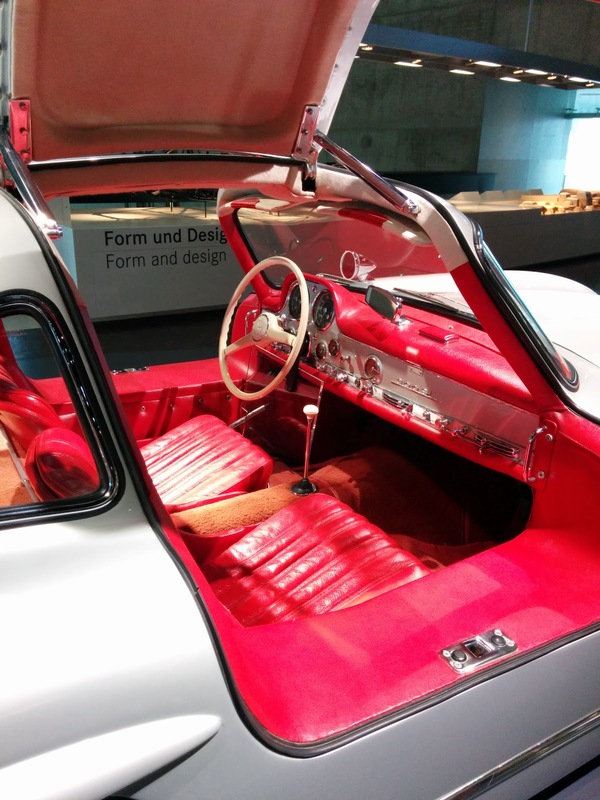 A 300 SL Coupe. Nice. 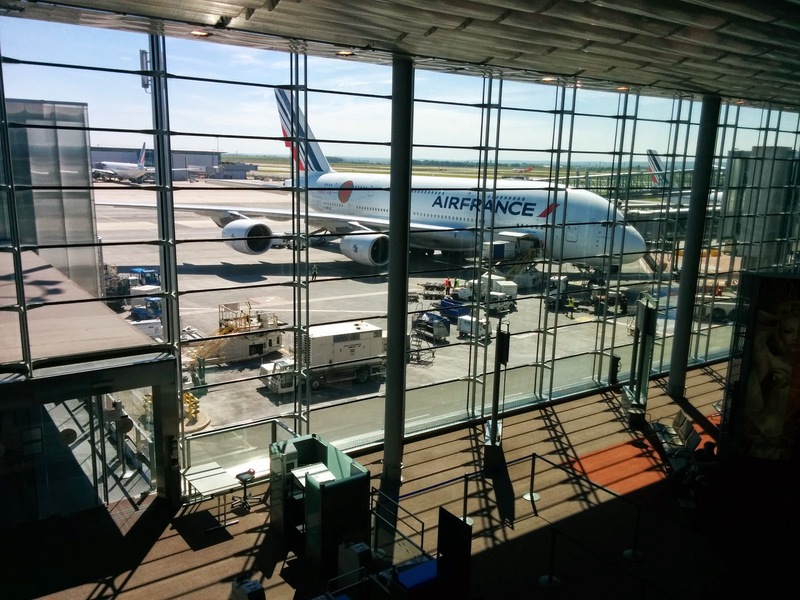 As you can see we made it to Charles-DeGaulle airport in Paris. Unfortunately, ground transportation was not nearly as efficient or enjoyable as the flight, so I missed my connection and got to enjoy the waiting room (and the -- not impressive -- lounge) at terminal 2G for a few hours. 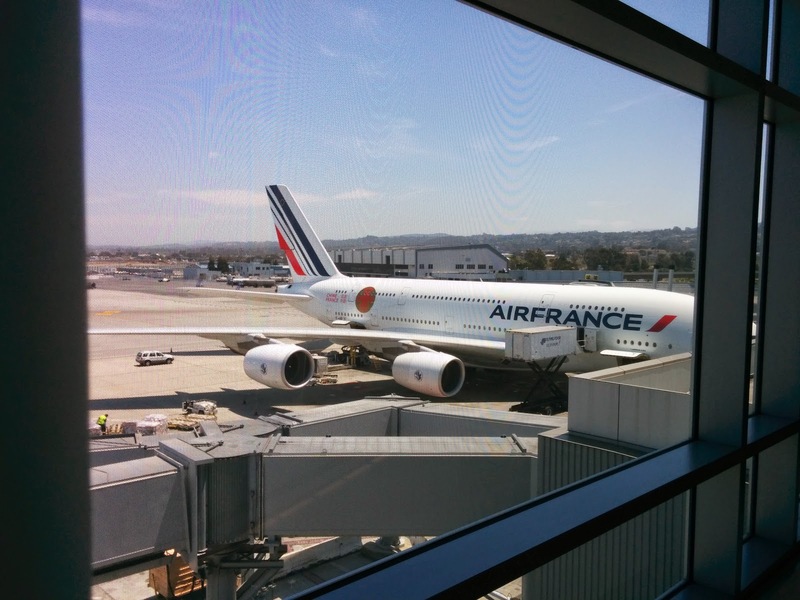 It's impossible to take good pictures of planes parked at gate A9 at SFO. 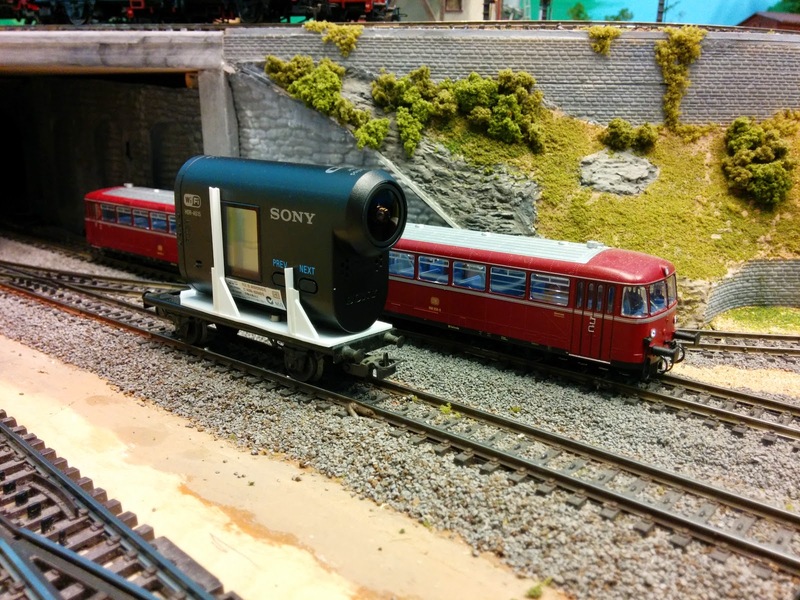 In a previous post, I introduced the Sony HDR AS15 and discussed more general aspects of using the camera for filming on a model railroad layout. 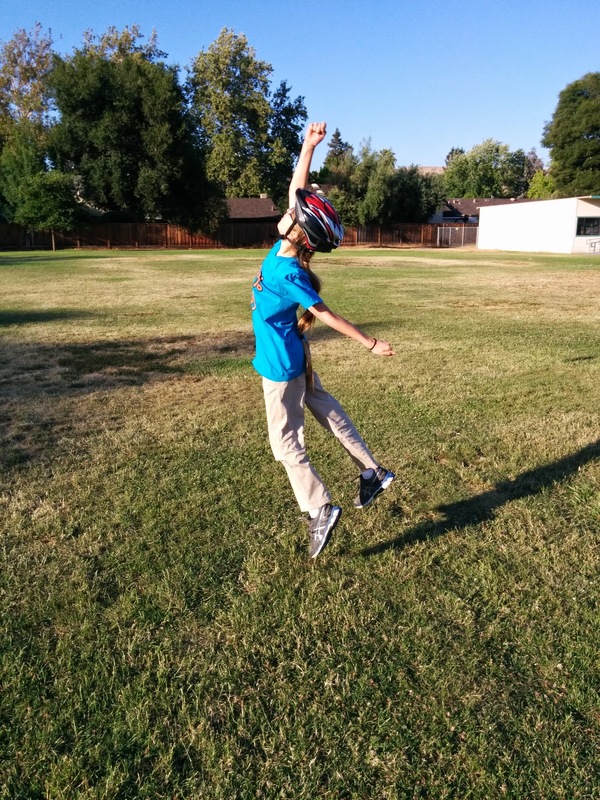 This post focuses on camera orientation and point of view. Since the body of the AS15 is symmetric it can be placed into the cradle normally, or upside down. There are distinct advantages to each placement. When placed with the lens at top, the vantage point of the recording is obviously fairly high above the track. You get the effect of what an engineer of a Turbotrain, a modern US diesel locomotive, or a DB VT601 TEE train might see. This orientation also tends to be useful for showing off scenery around the tracks, or look backwards over a train of open gondolas or hoppers. I recorded the Welztalbahn trip as well as the pass through Tracy at Silicon Valley Lines with the camera set this way. On the flip-side (literally), setting the lens low puts the camera at eye level of passengers in single level passenger cars, as well as matches the view of the engineer of a DB Schienenbus, which sits fairly low on the rails. A nice side-effect is that this puts the viewer much more in the action. This worked out nicely in the video of UP 844 in Kalamazoo at Silicon Valley Lines where I'm pacing the engine on a parallel track. Video recorded this way needs to be flipped in editing. 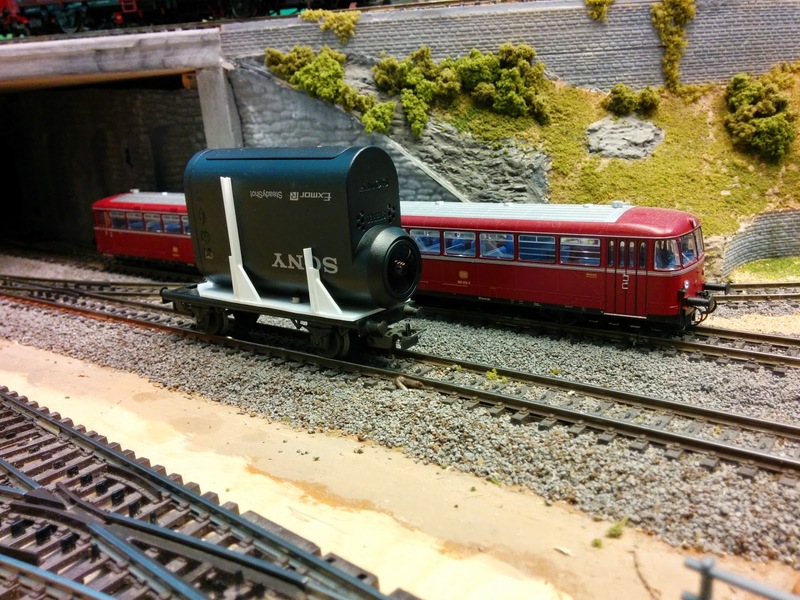 Given the very compact dimensions of the AS15, one can set camera at an angle on the flat car. The following two photos show the difference of the setup. Pacing a train with low lens. Looks nice on screen. Same setting but with lens at top. We can see more scenery, but also the roof of the Schienenbus. A note on depth of field: The AS15 produces a sharp picture starting at about 3 inches from the object. 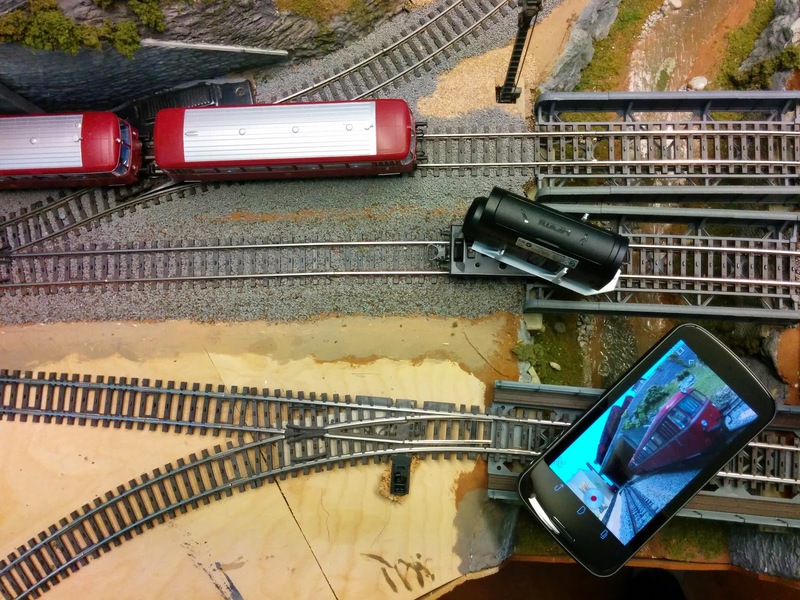 If you get closer, things will get blurry (as can be seen in the UP 844 video). The AS15 has two angle settings for the recording: 120 degress and 160 degrees. 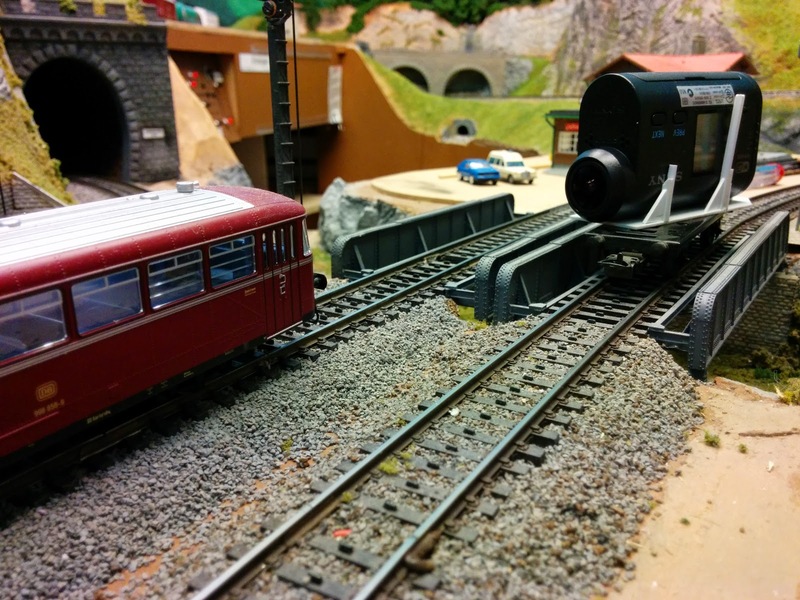 For model railroad video I always use 120 degrees, because vertical objects such as buildings, signal masts, etc. get badly distorted when the train is passing by with the angle at 160 degrees.